The march sets off from William Brown Street, Liverpool 3 at 13:00 and will end with a rally at the Pier Head, Liverpool 3. McCluskey (Unite), Billy Hayes (CWU), Bob Crow (RMT), Paul Nowak (TUC), Christine Blower (NUT), Dave Prentis (Unison) and Weyman Bennett (UAF) and Joe Anderson (Mayor of Liverpool). Music by Kof and Banner Theatre. Strong communities are safe communities – it is only by standing together that the haters can be beaten and communities can be defended against race hatred. This event is all about celebrating not dividing – Nick Griffin, BNP leader and MEP for the North West – is trying to divide us. We must stand united to make sure that he does not get re-elected in 2014. 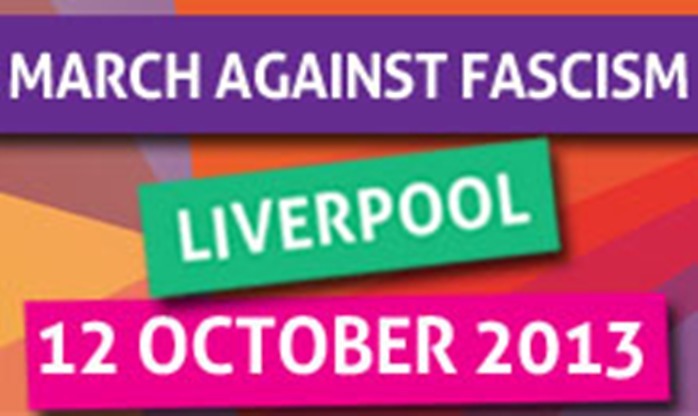 Join us in Liverpool on Saturday 12 October 2013 and send a clear message to the fascist far right – by coming together we won’t let the haters win. For more information about the event, including transport arrangements, click the following link.